Fiction – hardcover; Bloomsbury; 186 pages; 2017. Review copy courtesy of the publisher. 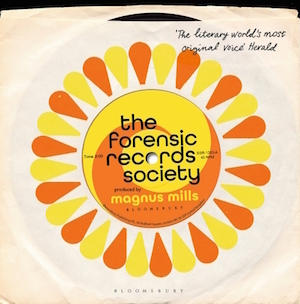 Magnus Mills takes the quintessential British obsession with music and turns it on its head in The Forensic Records Society. It is typical Mills fare: soporific, surreal and filled with deadpan humour. It is about two friends who start a club called — you guessed it — The Forensic Records Society. It meets every Monday at 9pm in the backroom of the local pub, The Half Moon. The idea is for each member to bring along three 7-inch vinyl singles, which they listen to (“in strict rotation”) on an old portable record player. There is to be no discussion, no commentary, no judgement of other people’s tastes. The idea is to listen to the music forensically. Of course, things don’t go according to plan. Not everyone follows the rules. A rival group forms. A splinter group soon follows. And the rivalry between each society becomes more heightened — and more absurd — as this short, quirky story proceeds to its humorous conclusion. I’m a big fan of Magnus Mills’ work and I’ve reviewed all his novels. This one is just as idiosyncratic, eccentric and fable-like as the rest. I love the way it pokes fun at music obsessives and the sometimes snobby nature of those who collect records. The way that James, the co-founder of the society, wields his rule book brought to mind a funny experience of my own. In the early 2000s I was at a Peter Gabriel concert, in the round, at Wembley Arena. A family of four were sitting in front of me: mum, dad and their two sons, aged around 8 and 10. The boys were forbidden from dancing or singing along to any of the songs. “You must listen to them carefully,” instructed the dad. “There must be no singing!” And boy, did he keep them to this self-imposed rule. I could just imagine this chap heading up The Forensic Records Society. The book also pokes fun at that quintessential British establishment — the pub — and highlights how having a few drinks with friends can seem to make time speed up: you never quite know where the hours go. The story also highlights how blokes bond over music; they don’t even need to talk about it. This is in stark contrast to the all-women rival group that forms — the Confessions Record Society (“bring a record of your choice and confess!”) — which encourages members to explain the emotional connection they have to particular songs. Like other Magnus Mills’ novels, there is little in the way of descriptive detail (I think he has a special aversion to adjectives), characters are only distinguishable from each other by their (rather ordinary) names and there’s no back story. The reader is simply plunged into a world that looks and feels familiar to our own, but isn’t quite normal. The fun is trying to figure out what is going on beneath the surface; what point is Mills trying to make about our society? There’s a little smidgen of mystery in this one, too — what is the unbranded single everyone keeps wanting to borrow; what is Alice, the barmaid’s, secret; and what does the taxman have to do with anything — which adds an extra level of intrigue. All in all, The Forensic Records Society is classic Mills. If you’ve never read him before, this is just a good a place as any to start. I love Magnus Mills even though you wouldn’t think I would from the rest of my reading, so I’ll be adding this one to my wish list! If you’re a music fan, you’re in for a treat. I reviewed this one here, and I was rather underwhelmed although I loved the conceit. The book was crying out for an index of music mentioned and links to a playlist, I was annoyed about how expensive it was too! Agree: it was crying out for an index but I think its absence is deliberate. The book celebrates music nerds, so the assumption is that you should recognise all the songs listed in the text. The performers, you’ll note, are never mentioned. I had a lot of fun recognising the song titles, although quite a few went over my head! Great post & I enjoyed the playlist! I read Mills ages ago but have lost track of him, I’ve got Explorers of the New Century buried somewhere in the TBR, I’ll have to dig it out! Oh yes, do read Explorers of the New Century. That one is particularly bonkers! I think I could sing (as in, sing along to) at least half of those. Actually did a short tour with Split Enz as a roadie. Sounds like a fun book. I supplied a semi trailer van (pantechnicon) to transport the 1977 Dizrythmia tour of the eastern states, and helped with the setting up. After 21 rehearsals and 21 shows I was pretty sick of them (sorry!). To be fair, 21 rehearsals and shows would test anyone’s patience no matter how much you love the band in question. I am so glad to know that he has another book out! I like reading about his view of the world. And thanks to your previous postings, I was introduced to a writer that I would have never heard of! It’s a good one, particularly if you are a music fan (like me). Hope you get to read it at some point, Isabel. Not sure how this one passed me by… Anyway, I’m a sucker for a playlist in a book (especially if it includes ABBA). It’s out in paperback now (or at least it is in the UK, not sure about Oz). It’s a great little read, especially in you are a music fan.